Boh Brothers Construction Co., the contractor currently installing a drainage canal on Napoleon Avenue between Claiborne Avenue and Carondelet Street, won the contract last week for the final phase of extending that canal down to Constance Street, authorities said. The $55 million phase currently under construction began in September of 2011 and is expected to end in March 2015. The final phase awarded this week, a $38 million contract, is expected to be finished in 2016. 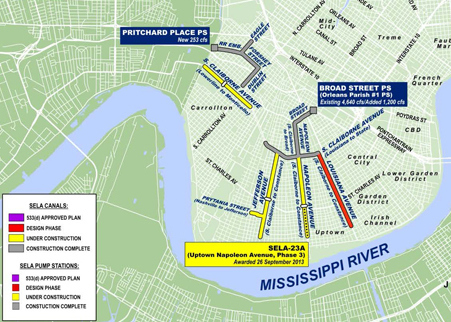 The U.S. Army Corps of Engineers, New Orleans District recently awarded a 38-month contract to provide increased drainage for the Uptown area. The contract includes canal improvements along Napoleon Avenue between Carondelet and Constance Streets. The project, which is part of the Southeast Louisiana Project (SELA), will reduce the risk of damages from a 10-year rainfall event. A 10-year event is basically a rain storm that has a 10% annual probability of occurrence and equates to approximately 9 inches of rain over a 24-hour period for our area. On September 26, 2013, the Corps awarded a $38 million contract to Boh Bros Construction Co. The contract calls for constructing approximately 3,000 linear feet of a concrete covered box culvert under the neutral ground along Napoleon Avenue from Carondelet Street to Constance Street. The new culvert will parallel an existing box culvert and will tie in to the new culvert under Napoleon Avenue at Carondelet Street and the existing box culvert at Constance Street. A notice to proceed will be issued early October and construction will be completed in the fall of 2016. The Corps continues to work closely with its partners at the Louisiana Coastal Protection and Restoration Authority and the Sewerage and Water Board of New Orleans on the SELA program. To date, a total of 17 contracts have been awarded in Orleans Parish to date, with work completed on 10 of those projects. All scheduled SELA work in Orleans Parish should be finished in 2018. So how can we save our oak canopy on lower Napoleon ? Exactly what I came here to comment on. There has to be some way to avoid the way they butchered the trees lakeside of St. Charles. Yes! This is also what I was wondering!! Please, how can we save our oak trees?? Molly, you are so right. The oak canopy on lower Napoleon will be slashed and vandalized just as the lovely oak canopy on upper Napoleon was destroyed–and for no practical purpose!! The branches, with a few exceptions, didn’t extend over the neutral ground. This massacre just put money in some vile contractor’s pocket. This criminal treatment of our live oaks, one of this city’s crowning glories must not be repeated!! I will email Latoya Cantrell’s office and start the dialogue.